It all started with a family going through a mother’s memory box after her passing. Or in our mother’s case many memory boxes! Some of you are familiar with my mother, Helen Rice Nolden. She was born and raised in Anamoose and while she did leave from time to time to explore other places, she was always drawn back to her hometown, her beginnings and where her heart was. She was taught life 101 from her parents, her older siblings; as well as a variety of Anamoose teachers and citizens. And what she learned was handed down to my siblings and me in spades! Love of family, hard work, giving to and giving back, saving the past for the future, and being grateful for the freedoms of the country we live in. We were taught these freedoms were not free and came at the price of brave young people making a commitment to keep all of us safe and free. Patriotism runs deep in the family in one way or another. I remember my grandfather, Kasimir Rice, telling us how lucky we were to be born in this country and how very proud he was when he became a US citizen (I still have the test and scores, the small flag and the photo, he was looking so pleased). So when we found this package of military rank and unit patches in among our mother’s things, we wondered what intentions she may have had for them. We weren’t sure where they all had come from. Mother’s two brothers Kasey Rice in the Army and Allie Rice in the Navy served, both during WWII. Her two sons Tom Nolden in the Army and John Nolden in the Army National Guard and Active Army served. One grandson, Chris Toth served in the Army Reserve and lastly, two great grandsons Joe Toth in the Army and Mike Palmer in the Marines served. My sister, Barbara Nolden volunteered to be the keeper of the patches until she could do some research and decide what should be done with the military memories. 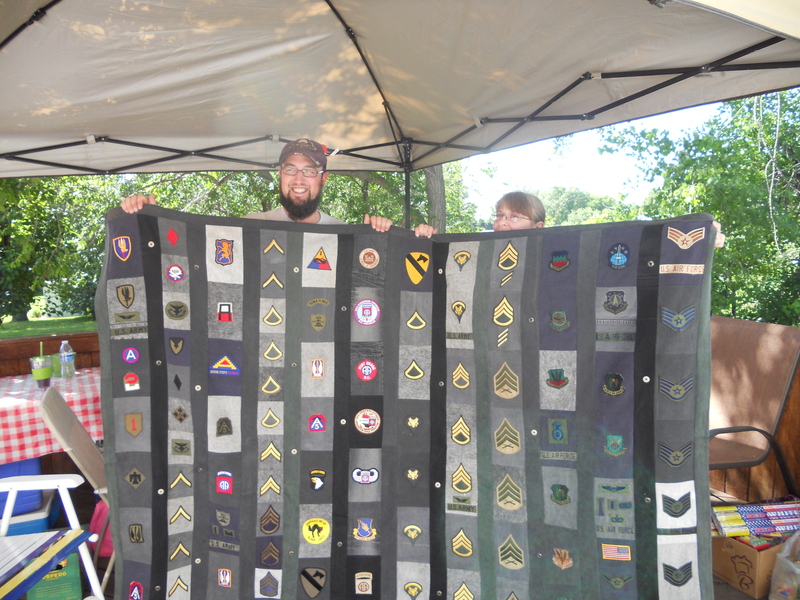 So the quest began, first by gathering more patches from members of the family, then the inspiration to compile all the patches into a quilt to be kept in the family as a reminder of those we are grateful to for their service to keep us free. When Barbara told me she had found the way to preserve the patches our mother had saved so carefully so long ago, I thought to myself “WOW” what an ambitious project! She sounded so excited about getting started, shopping for the right fabric, the right thread, collecting more patches to fill the blocks and finding military buttons to tie the quilt. Every day there was a new progress report and I could hear in her voice the excitement and emotion that this project was evoking. Then just before the quilt was completed came the question, how to determine who would be the recipient of the quilt. Barbara used her own formula and we siblings agreed. The quilt (and Barbara) appeared at the VFW in Anamoose, the VFW in Minot, and on the KX Noon Show with Karla Burbidge, before making its way to Anamoose for the final presentation. On the July 4th weekend 2014 great aunt Barbara Nolden presented it to Joe Toth, Helen Nolden’s, great-grandson, at a small family gathering in Anamoose. He was not expecting it, but seemed to be pleased with the task given him to be the keeper of the patriotic quilt. Both Joe’s proud grandmother’s Dorothy Leier and yours truly Jacque Reis are Anamoose residents. What a great way to celebrate the freedom gained on the 4th of July in 1776. Thank all who have served our great country to keep all of us safe and free!